We’ve all heard it. It’s the age old ‘build vs. buy’ software debate. You (assuming you are a financial institution or a market maker) have a great challenge of deciding whether you should save money with a ready-to-go solution or invest in a costly and time-consuming yet customizable option. You find off-the-shelf software solutions ideal because they are fast and affordable but at the same time fear a lack of customization in day-to-day operations. You need a software that is scalable and easily adaptable but need to be conscientious of investing in building proprietary software as it can have a severe impact on time, costs, and it may be difficult to find the required expertise to build. What if we told you that TickVault offers a solution that makes choosing between the two easy? Let’s backtrack to what the actual problem is. As the need for Big Data technology grows, so does the debate for “build vs. buy”. Big Data technology is proving to be the best way forward for Capital Markets that want to have a next-generation platform to future-proof their infrastructure. You are perhaps now looking at Hadoop and other open-source software to help you build an in-house infrastructure and/or cloud-based infrastructure. However, many others like yourself are realizing that building a Big Data infrastructure requires mastering a whole new sets of technologies, methods, and programming languages. While this may be appealing for the technologists in your firm who see this as an opportunity to learn cool new technology, it will affect platform availability timelines and can needlessly multiply costs. Additionally, in the time it takes to build this new technology, your large amounts of unmanaged data are likely to grow and become harder to process for use. So you are still stuck having to choose: Build or Buy? As Big Data evolves, so does the need for analytics. As mentioned previously, you will likely purchase a Hadoop-based infrastructure and have your data scientists write code to interact with it. However, when your infrastructure breaks, becomes outdated, or needs to be scaled up, it creates another problem that distracts data scientists from analyzing data sets. Data scientists are spending the majority of their time on low-value, high-effort tasks.To be more specific, it was reported that 80% of a data scientist’s time is spent on data wrangling, data preparation, and data cleaning. 57% of data scientists noted that it was their least favourite task. That is not valuable for anyone. 1. Big Data technology is hard to master; and requires a lot of time and money. 2. Not many Big Data software solution providers are adaptable to your changing needs. 3. Your firm has more data to go through then ever before and less time to do so therefore insightful analytics remain untapped. Remember when I told you that we made the choice easy? 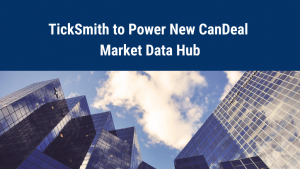 Since 2012, when we created TickSmith, we have specialized in big data technology and have built a next generation data lake platform, TickVault, to solve the pains of centralizing Big Data in Capital Markets. The platform already provides solutions to many financial institutions including National Bank of Canada and the CME Group. The advantage of working with TickSmith is that you are still very much in control of what your end product will look like, without the costs and time that are required when building an in-house platform. Our developers are experienced in enhancing our own platform, but also building on top of firms’ infrastructures. a. You don’t have to spend your time and money reinventing the wheel. We have been perfecting our Big Data Lake platform since 2012 and provide it as a ready-to-go platform that you can have up and running in your infrastructure within weeks. We provide a solution that is future-proof because it scales and continues to evolve using the latest big data technologies. b. We provide an adaptable platform and our functionalities pivot around your business needs. If you come to us with an objective in mind, we have an experienced and talented team that can adapt our platform to fit your current and future needs. You can also work with your in-house developers to build add-ons on top of our platform, TickVault. c. We save your firm’s valuable time because our platform does all the data wrangling, data preparation, data cleaning for you without replacing the current infrastructure you have! All you need to do is point to the data you would like to ingest. Our platform (running in your physical and/or cloud infrastructure) cleans it, prepares it, and then you access it via our multiple APIs so that you can perform your own analytics, machine learning, predictive analytics, artificial intelligence (AI), etc. Many financial institutions have already attempted to address their business needs by building their own solution but realized it was best to outsource as the issues they were facing were preventing them from focusing on their business strategy. We have a proven track record in helping financial institutions optimize monetary opportunities at a higher pace.